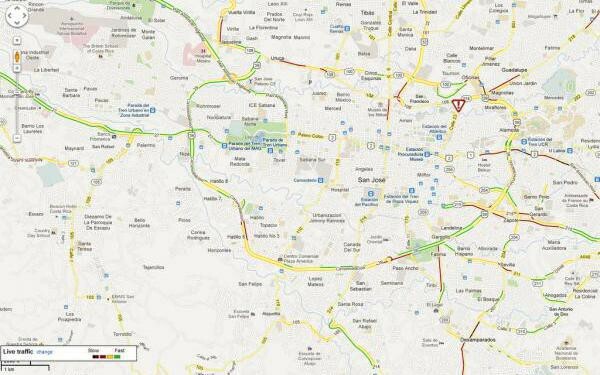 Note: The National Public sector strike (huelga) and protest “marches”/road blocks (see current strike summary) are causing delays around Costa Rica. Check road & traffic status. The WAZE app is a popular Google navigation product which gives directions, tracks phones positions in real time and allows users to pin comments on police speed traps, construction, accidents and other delays. (details on how it works). Instant information on traffic conditions is especially helpful when traveling in Costa Rica because there aren’t that many ways to get from point A to point B. Going around a landslide could easily add five or six hours to a two hour drive. Instant updates on jams and slow moving vehicles are available on smartphones or on the internet using this map from WAZE and now you can even use WAZE in offline mode so you don’t have to pay for international roaming cell phone data. Check traffic congestion before you head to the airport or make a trip to the beach. There are some insanely bad roads in common use in Costa Rica and especially on alternative routes we’ve found ourselves locked into 4WD low sliding down an inescapable boulder strewn ravine bottom just praying that there’s a way out because there’s definitely nowhere to turn around… WAZE does learn what’s passable and what is not based on whether other drivers have gone that way but those other drivers may well be absolute maniacs. Bad roads aren’t the only hazard lurking on Costa Rica’s less traveled routes. Bad neighborhoods (think of the stripped family truckster surrounded by thugs in National Lampoon’s “Vacation”) are a problem in and around (but not strictly limited to) San José, Limón and Puntarenas especially after dark. Another hazard that you may never encounter at home is a river ford (see how to ford a river in your vehicle). For crowd-sourcing to be effective you need a crowd contributing data in real time and while cell phones are almost ubiquitous in Costa Rica signal is not. There are some stretches of a number of Costa Rican roads that have no cell service which means they are effectively invisible to WAZE traffic updates. There could be 500 cars sitting perfectly still on the Guapiles Highway in the mountains of Braulio Carrillo and WAZE would show no problem because none of the phones have signal to update WAZE. It will be interesting to see how good the construction delay info is based only on users comments instead of phone data when a Chinese construction firm begins work to expand that road to four lanes in 2018 until 2021. The transit police maintain a web based list of updates which includes landslides, washed out bridges and other delays/closures on major routes. They do a good job of keeping the road information up to date for a few major routes but unfortunately the website is frequently down for days or weeks at a time. It is in Spanish. You can try dropping the url into Google Translate or another Spanish to English app but they use a lot of vernacular and usually the English version is less intelligible than the original.